These mirrors are three directions offering a 180-degree view of an area. 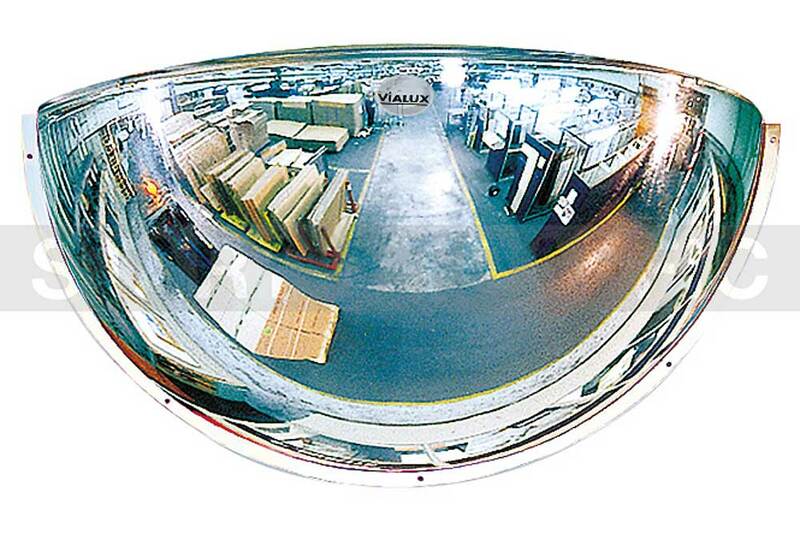 If a four direction mirror is needed then please check out our full dome mirror. When installed behind machinery or above these wall mounted mirrors allow operators to keep an eye on operations behind them or behind the machine. These half dome mirrors are easily mounted to walls and generally are installed as high as possible (without being too far away) so that they are out of the way of moving equipment. When buying your half sphere mirror it is important to ensure that you get the correct size of mirror. Each size has a maximum recommended viewing distance, choose a mirror that is too small and you may not be able to make our important details. The attached table gives the mirror sizes and their corresponding maximum viewing distance. The original unbreakable lens material is ultra hard wearing and offers a great high clarity image. Comes with a 3-year warranty This page is for a Polymir Lens. This material is a little cheaper but is not as strong as the POLYMIR material and therefore only carries a 2-year warranty. If you would like to purchase a PMMA material mirror you can do so on the PMMA page. Our customer service team are here to help you get the best mirror for your needs, they are available on 01905 794 875. If needed we can arrange a site survey which is 100% non-obligatory, our experienced mirror specialist will survey your site and help you identify problem areas and the best mirror type to address the issue.